Anxiety is second only to depression as the major cause of mental health problems in the world. 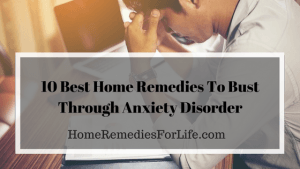 If you too are suffering from anxiety disorder, then it is time for you to treat your anxiety using home remedies. Here are 10 effective and best home remedies for busting your anxiety disorder. It lowers anxiety along with reducing nervousness, helps lowering insulin levels and improves sleep. Ginger is effective at treating nausea or an upset stomach that can be caused due to anxiety. Full of nutrients and rich in Omega 3 fatty acids, consume them with warm milk for effectively relieving anxiety & an upbeat mood. The smell of an orange decreases anxiety, has a calming effect, increases immunity and positively improves the state of mind. It improves appetite, reduces nervousness, relaxes muscles for better sleep and boosts memory too. It tackles anxiety related symptoms such as gastrointestinal issues, asthma, cough, etc. Fennel tea is good for treating panic attacks too. It improves sleep and overall mood along with pain-relieving, anti-anxiety benefits. It eases anxiety, relaxes nerves, stimulates the nervous system and quickens healing. It is available in various consumable forms like tea, juices, extracts. Water boosts hormones that enable your body to work at peak level. On the contrary, dehydration can make anxiety even worse. Mix it up with some honey that’s known to help relieve anxiety. Helpful in relaxing the brain. It is easy to do, doesn’t need special training, can be done anytime and anywhere. You can check out blogs discussing more about relieving anxiety to help you out!